Planning and Design Group (P&DG) is seeking to appoint Graduate Planners and Town Planners into our busy and expanding Midlands Office of Planners and Urban Designers. These additional positions are required due to increasing workloads and our ever expanding client base. Working for both the public and private sector, our wide and varied client base includes; house builders, strategic promoters, pension funds, county councils, local councils, high profile retailers, schools and universities, the NHS, industrial and construction companies, care providers, footsie 250 companies, resident action groups, and many major employers. We also work for individual land owners and prestigious country estates. Our day to day work is also wide and varied as we deal with all stages of the planning process; from initial site identification, to providing full project management services, ad hoc advice, planning appeals, local plan examinations, through to major planning applications including EIA statements. We also run our own in-house master planning and urban design team. Based on the edge of Nottingham, our Midlands Team also provides support to our London Office. With a wide range of planning services provided and an increasing geographical spread, our professional team provide a bespoke and added value service to our existing and loyal client base, as well as helping to market and promote the business at various local and national events throughout the year. If you are looking for an exciting opportunity to broaden your experience and accelerate your skills, whilst working within a supportive and dynamic team environment, alongside experienced Planners and Urban Designers, we can offer a vibrant workload and competitive salary package and benefits. Considerable opportunities for career development for the right candidates. If you are interested in applying for one of these roles please submit your CV with a covering letter to P&DG Admin. If you would like an informal discussion with one of our Directors regarding these roles, please speak initially with our office administrator Jayne Horne. 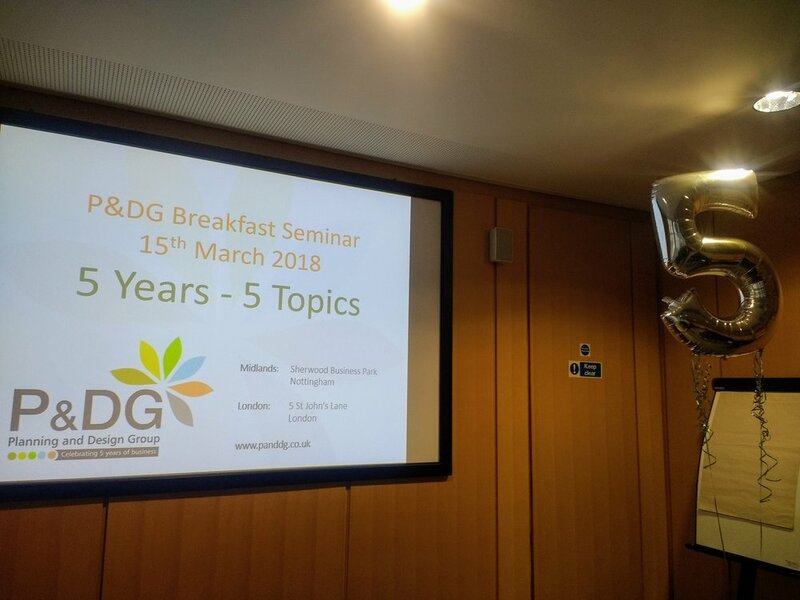 P&DG continue to celebrate Five Years in Business with another carefully planned Breakfast Seminar providing you with an update on the new National Planning Policy Framework (NPPF). We'd like you to join us on Thursday 27th September 2018 at the Nottingham Conference Centre from 8.30am until 10.45am. If you'd like to book to attend please contact us as soon as possible as places are limited! On the 24th July 2018 the new National Planning Policy Framework document (NPPF) was released. Our breakfast seminar will highlight what you need to know about the new document and the implications for our clients and contacts within the development industry. We will explain the main changes that have occurred to the planning system via the replacement NPPF. We will consider the implications with practical examples and provide insight and professional guidance to consider both for existing and future development projects. We will set out the implications on housing need and supply for authorities across the East Midlands that will be ‘enforced’ by the new Housing Delivery Test contained in the new NPPF. We will clarify the new rules on pre-commencement conditions coming into operation on 1st October 2018, and explore the implications for planning timescales and information requirements. We will also pose the question: Are the East Midlands' Local Plans geared up to the changing high street retail and distribution warehousing markets? How will the new NPPF impact on this? Email us to book your place today! This year P&DG is five years old. You are cordially invited to our Five Years, Five Topics Birthday Breakfast Seminar on Thursday 15 March 2018. We'd like to thank you for your loyalty and support over the last five years and very briefly share with you a few of our major achievements and successes. Looking forward, we will discuss the revised NPPF, due for consultation in Spring 2018, drawing on both the Housing White Paper and Autumn Statement of 2017. Providing a broad indication of where we consider key areas of change are likely and a reminder that the push for housing delivery and economic growth will not subside, creating many new opportunities for your land, planning sites and projects. We will discuss how social media is helping communities become increasingly mobilised, well informed and empowered to steer planning application decisions and future local plans. We will also discuss the increasing need to pro-actively work with planning officers in order to address community pressures arising through social media throughout the application process. We will be taking a closer look at the 'big picture' presented at the last breakfast seminar (within the context of changing housing need calculations across the East Midlands) together with an emerging longer term drive for growth, e.g. Leicestershire's 'Strategic Growth Plan' and D2N2's 'Strategic Economic Plan', which will increasing require new sites to be identified. Our final topic will be focussed on the debate about the changing nature of retail provision and declining town centres. Could Planning Policy's protection of town centres 'at all cost' actually be detrimental. We will explore more flexible options for town centres and out of centre retail uses. There will be an opportunity for questions and comments at the end of the seminar. Our team will be on hand from 9.15am until 3.30pm to discuss your current and potential Planning projects. The planning system has gone through considerable pro- development changes and updates over the past 12 months, at the point of writing we also have a forthcoming referendum which could present future changes to that planning system. P&DG's breakfast seminar will look at those changes, the impact of the referendum and attempt to provide insight and experience of Maximising Development Opportunities in the changing planning system. The seminar will be supported by speakers from Planning and Design Group (P&DG); and guest speakers from County Land and Business Association (CLA) and Baker Consultants. Registration, breakfast and networking from 8.30am to 9.30am. Seminar 9.30am to 10.45am. Members of the P&DG Team will provide advice on 'Maximising Development Opportunities in the current Planning Environment' and an update on London Planning Environment under the New London Mayor. Rural Planning Issues and European Protected Species - Legal Position A minefield that is being slowly cleared? Baker Consultants offers an ecological consultancy service backed by thorough scientific knowledge and a meticulous understanding of the regulatory framework.